Been in blogging hibernation recently, not for any particular reason, other than the demands of a full teaching timetable. Those who do manage to blog with such inimitable frequency, I take my hat off to you! On the list of my own priorities it currently features below writing my Key stage 3 reports and planning this weeks lessons on the Bard 🙂 However as my fave form of professional development for thinking and reflection, I’m setting myself a 5 week challenge to write a post per week. (5 weeks today we break up for the summer). I was thinking about writing on curriculum last weekend, then as so often happens in blogosphere, I stumbled across a post that encapsulates my thoughts entirely and saves me the time, this came in the form of this post by @jo_facer on E.D.Hirsch’s Cultural Literacy. Jo has proposed to put forward ‘just one book’ for what she sees as the key aspects of education, which in turn inspired my own challenge. I’m going to write a short synopsis of the books that have had some of the most profound impact on my thinking in 5 key areas. To whittle myself down to choosing just one book in each of these categories was a significant challenge, so many to choose from and I have changed my mind a few times before publishing this! However here goes…. Beginning with Leadership, I received a Skype call from a friend during the summer of 2013. She was on holiday in France at the time and during the conversation waved an orange book at me saying you will love this book, you need to grab hold of it. 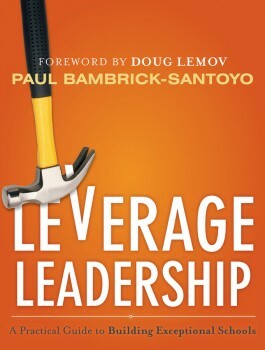 Leverage Leadership is a practical guide that seeks to identify the key levers of highly effective school leadership. Based on the North Star schools in Newark, New Jersey, overwhelmingly attended by disadvantaged youngsters, yet gaining international recognition for dramatic gains in student achievement. The secret to their success, effective school leaders carefully and intentionally chose the actions that have the biggest impact on student learning and avoided those actions that don’t. Data driven instruction. Define the roadmap for rigour and adapt teaching to meet students’ needs. The most effective schools build effective and continuous data driven conversations between teachers and leaders. Successful DDI depends on assessment, analysis, action and systems. Assessments define rigour and are common across a Dept. Begin with the end in mind, start with the test and work backwards as to how and what you will teach to get students there. How a leader uses the time they spend analysing assessments with teachers is what dictates the results. Data analysis meetings allow leaders to see how effective the learning has been. Great data analysis starts from clear and intuitive data reports which show class performance at 4 levels, question level, skill level, student level and whole class level. Great leaders make sure that the results of data analysis meetings translate into real classroom changes. Attaching due dates to action steps establishes clear expectations. Observation and feedback. Give all teachers professional, one on one coaching that increases their effectiveness as instructors. Becoming a master teacher is often considered as a slow process, as much as ten years. Yet teachers who engage in a regular observation-feedback loop for development purposes (weekly observations and feedback) will see these changes in one to two years. Feedback is most successful when leaders track which teachers have been observed, what feedback they have received, and whether that feedback has improved their practice. The primary purpose of observation should not be to judge the quality of teachers, but to find the most effective ways to coach them to improve student learning. Instructional planning. Guarantee every student well structured lessons that teach the right content. Effective schools avoid some well known pitfalls. Teachers need to determine what aspects of each unit require greater importance and depth. Autonomy is valuable, though giving this to all teachers means that some will have the “freedom” to fail to plan effectively. Leaders should conduct planning meetings to build their own curricular understanding in areas where they are not familiar. When leaders know the questions to ask, the plans that result pave the way for outstanding student achievement. There are three basic steps to effective daily lesson planning 1. Map out the week, 2. Set the core content, establish the key objectives 3. Dive into key lessons, develop tight activities. Professional development. Strengthen both culture and instruction with hands on training that sticks. Too often, even the ‘best’ professional development ends where it begins-in the conference room. PD only matters if it translates from paper to practice, driving real improvements to student learning. Combine with follow up activities post workshop to guarantee effective implementation. Professional Development is only successful if leaders are able to see evidence in classrooms the next day or a few months down the line. By implementing the leadership systems for data driven instruction, observation, feedback and planning, leaders guarantee that PD sticks. Student culture. Create a strong culture where learning thrives. In schools with strong cultures, students receive a continual message that nothing is as important- or as engaging- as learning. If you want a culture of excellence, you build it by repeated practice. Every moment that students practice the right things are moments that they then build habits of excellence. Every school leader has a vision for the kind of school culture they would wish to create, what sets exceptional schools apart is that the top leaders transform their vision into meticulously built systems that operate across every single classroom. Staff culture. Build and support the right team for your school. When leaders create a vibrant and joyful culture, teachers are more willing to be held accountable and more willing to do the hard work that makes a school work because there is a level of respect, trust, and appreciation for the work that they do. When people are happy at what they are doing, they are more likely to do amazing work with the students. The 5 most important places to focus on are: 1. Set the vision 2. Get the right people on the bus 3. Put a stake in the ground. Reflect your commitment to developing a strong staff culture by prioritising it from the first interactions of the year. 4. Keep your ear to the rail. Look and listen for negative culture warning signs. 5. Lather, rinse, repeat, staff culture is fragile. If you’re not intentional about building, maintaining or communicating your staff culture, someone else will define it for you. Managing school leadership teams. Train instructional leaders to expand your impact across the school. Leaders are rarely coached around what matters most: the quality of their meetings with teachers. Change your leadership team’s purpose and you’ll change results. Building a strong instructional leadership team is the core task of leaders who want to build successful schools. Instructional leaders can me made up of Senior Leaders and lead teachers. For this model to work, it is essential that the team be committed to the practices of data-driven instruction, regular feedback, and systematic planning. The central message behind Leverage Leadership is for leaders to confront how they use their time. Ultimately, the question is not whether it is feasible for leaders to pursue the systems above, but whether they can afford not to. Next week’s 5 weeks 5 books post: Everyday teaching for highly effective learning.